Early on, we decided to plan our own trip instead of engaging a tour agency– So what’s next? Firstly, we searched for a map of Taiwan and we found this on WikiTravel (http://wikitravel.org/en/Taiwan). 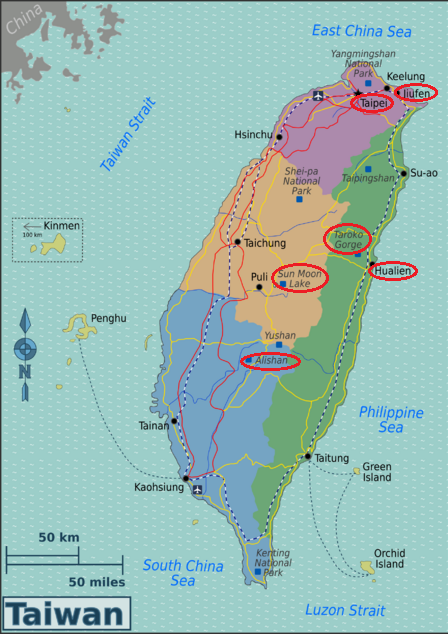 As you can see from the map below, the island is divided into four regions – Northern Taiwan (Purple), Central Taiwan (Orange), Southern Taiwan (Blue) and Eastern Taiwan (Green). There are three international airports in Taiwan, namely Taoyuan International Airport, Kaohsiung International Airport and Taipei International (Songshan) Airport. Since we’re taking AirAsia, we’ll be landing at Taoyuan International Airport and taking off from there as well. We actually ‘bought’ a Lonely Planet travel guide for reference while planning for this trip. It would have cost us RM105.30, but thankfully, we were able to redeem it using the book vouchers given by the government in January this year. We thought the guide would come in handy, but in the end, we only browsed through the pages and relied mostly on the Internet to search for information. Still, it’s a good place to start. From the official websites listed above, we were able to find out the routes, travel time from one station to another as well as the ticket prices. In addition, we were also able to buy the tickets online. Before you buy your tickets, do check for promotional fares etc. For Taipei-Hualien route, it is advisable to buy your tickets in advance (2 weeks prior to your travel date) as the seats are limited. Otherwise, you would have to stand all the way to Hualien (at least 2 hours). One way ticket would cost you around NT$440, but if you buy return tickets, you would be given a 10% discount. Please note, though, that the payment window is in Chinese. If like me, you are not literate in the language, you may get stuck here. Thank God for a husband who reads Chinese. As for the Metro (MRT), you can buy tickets at the station on the day itself. If you plan to travel extensively using public transportation, then you should get yourself a travel card (EasyCard) to avoid the hassle of queuing for tickets. In addition, you can enjoy 20% discount off your MRT rides. The EasyCard is available for purchase at all MRT stations. For a standard adult card, you would have to pay NT$500 (inclusive of NT$100 deposit and NT$400 balance). The deposit and unused fees are refundable. If necessary, you can add value to your card at any MRT station. Besides taking public transportation, we have also hired three drivers for approximately 8 hours each – the first driver will bring us around Taroko Gorge in Hualien (NT$3500), the second driver will ferry us from Alishan to CingJing, stopping at Sun Moon Lake along the way (NT$5000) and the third driver will drive us to Yehliu, Jiufen and Shifen (NT$4000). To source for reliable drivers, we read reviews on travel forums such as www.tripadvisor.com. One of the drivers was recommended by friends. We emailed the drivers and after confirming the fare, the pick-up and drop-off points, as well as the itinerary for the day tour, we proceeded to make payments (some drivers require full payment, while others only require partial payment/deposit). Payments could be made through Paypal or by credit card. After we had identified the places that we would be visiting, we proceeded to search for accommodation in each area. We relied heavily on the Internet to search for comfortable ‘minsu’ (homestay) or hotels to suit our budget. Again, we combed through travel forums and blogs for reviews and then we looked up the ‘minsu’ or hotel websites to check for further information such as room rates, location, available facilities etc. Besides comparing the room rates $$$, it is also crucial to consider the location of the hotel/minsu and the services provided. Sometimes it is better to pay more for accommodation in a strategic location so that you do not have to waste time and money commuting. Personally, Kiate and I prefer ‘minsu’ to hotel. Firstly, it is more homely. You can enjoy home-cooked meals while away from home! Secondly, you can get a taste of the local culture through casual conversations with the ‘minsu’ owners. From what I gathered from friends and relatives who had been to Taiwan, most ‘minsu’ owners are very friendly and helpful folks. Besides, you will also find that ‘minsu’ owners put a lot of thought into decorating each room. You can pick your favourite theme from those available. In addition, most minsu owners would gladly provide free shuttle to and fro the train/bus station if you request.